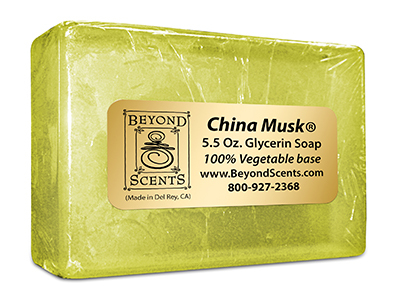 China Musk® has a nearly 5-decade long history of captivating the senses of those who love exotic yet subtle fragrances. The timeless essence is sultry and soft for women yet surprisingly light and wonderful on men – and perfectly suited to customize all your bath and body care favorites. Indulge in this soft yet tantalizing fragrance as a perfume, cologne, moisturizer, hydrating mist, and more as you choose from our vast selection of spa-quality products that can be customized with China Musk®. We make it easy for you to personalize an array of bath and body care products with this exotic, powder-fresh blend of sensual light musk, Chinese rose, sparkling clean citrus plus vanilla and warm amber spice. Use the classic scent to add a special touch to our shampoos, body sprays, alcohol-free massage oils, and lotions. Enjoy the alluring essence as a perfume or cologne in 6 convenient sizes. It’s perfect in our linen spray for a calm, relaxing way to climb into bed and end your day. Add China Musk® to our Elder Flower Hydrating Lotion to revive your skin with crisp floral and musk notes, use it to enhance our Green Tea & Botanical Body Wash for a refreshing twist to your shower, or blend it with an array of our other scented selections for fragrant flair. Select your China Musk® Products and Perfumes below. 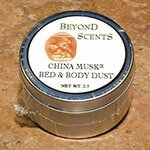 We purchase our China Musk® perfume oil directly from the original creator. China Musk® is a registered trademark jointly owned by A.K.A. Saunders, Inc., 2700 Rydin Road, Unit D, Richmond, CA 94804 and Body Time®, 707B Heinz Ave, Berkeley, CA, 94710.